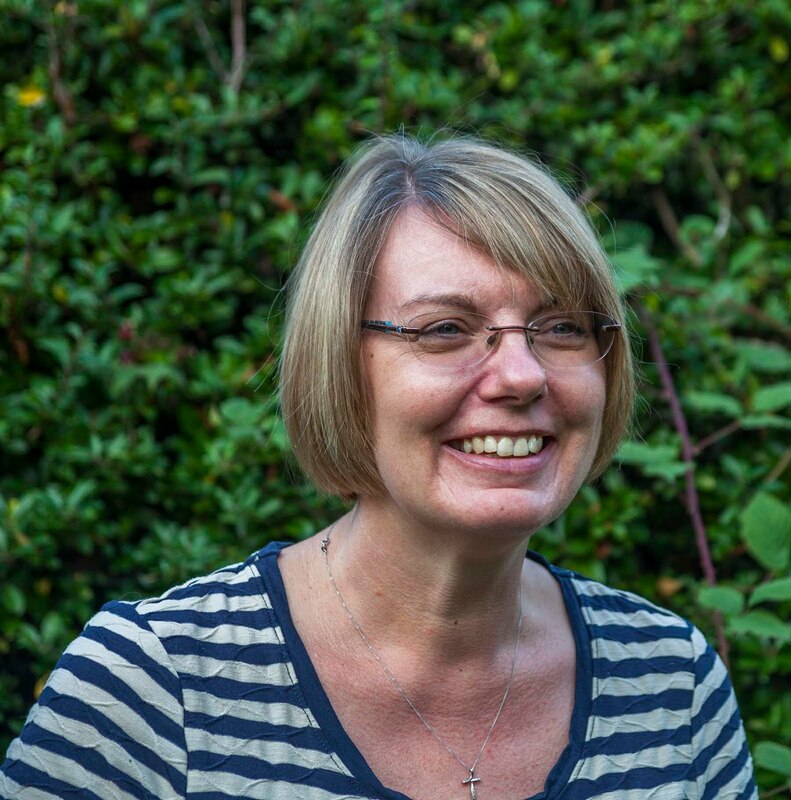 Today we welcome Avril of Mrs B's Crafting Addiction as our Guest Designer. 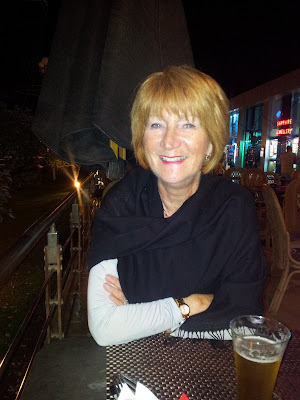 Avril was chosen by the DT as the winner of the Floral Frenzy challenge and was asked to join us for a day. So now let's move on to hear from Avril. Hello, I am Avril (also known as Mrs B in blogland) and I am absolutely delighted to have been invited to feature as Guest Designer here today. I have always been interested in anything creative, I've knitted, sewn and even embroidered, but now my main interest is cardmaking. 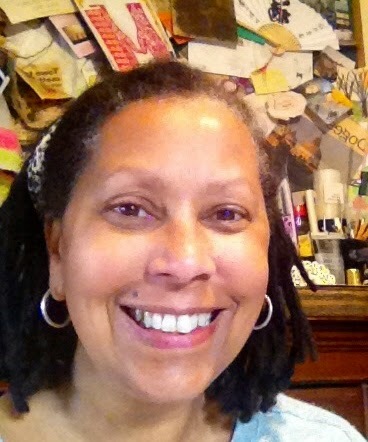 I love nothing better than taking myself off to my little craft room and making a mess, in every respect! I was given some Tyvek envelopes by a friend and not really being sure what to do with them I initially put one on my 'spray box'. The leftover inks do take a while to air dry, but the accumulative results have a gorgeous sheen. This piece had some Dylusions Dirty Martini and some Tarnished Brass stain. 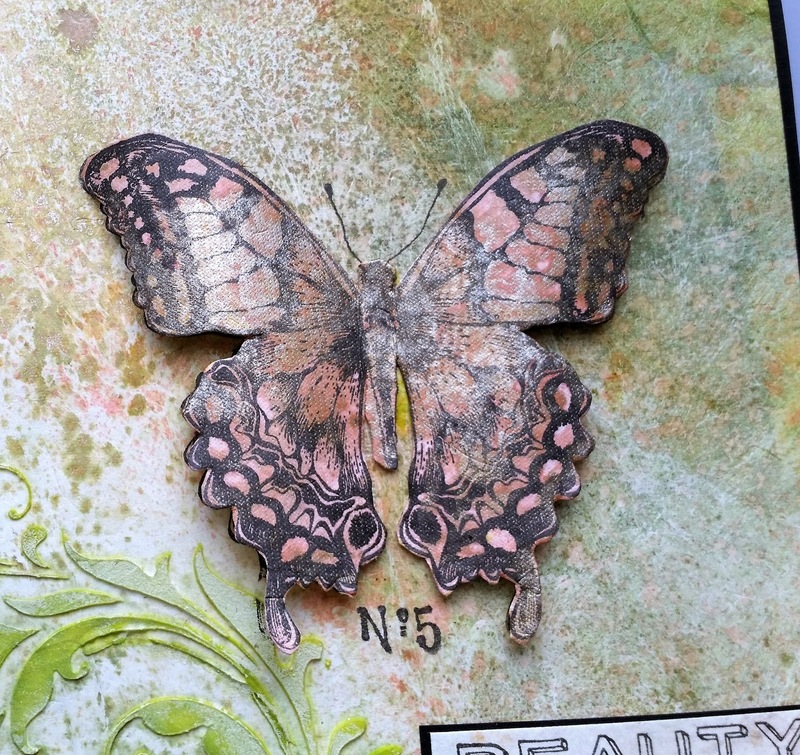 I stamped the Butterfly where I wanted it on the card so that I had the antennae, and then on another piece of Tyvek that had been sprayed with Abandoned Coral and glued to a piece of card, I stamped but butterfly again and fussy cut. 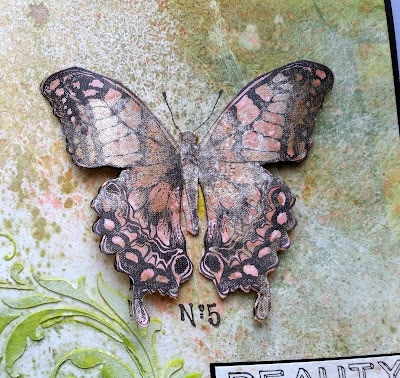 I gave the wings a little shape and then mounted it over the stamped butterfly, and stamped the No. 5 with Black Archival ink. I stamped the sentiment onto a lighter piece and then cut apart. I matted these onto black cardstock to finish. Thanks again for picking my card and for inviting me to join you as Guest Designer ! 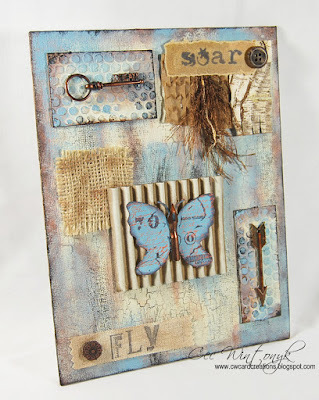 I'm sure you'll all agree that Avril's card is gorgeous and has provided even more inspiration for the current challenge which is Time to Take Flight which you still have plenty of time to join in with ! Autumn of SewPaperPaint here with you today. I don't know about you, but I have seen a rising trend in blogland that has thoroughly peeked my interest. Dark and moody mixed media project seem to be all the rage! 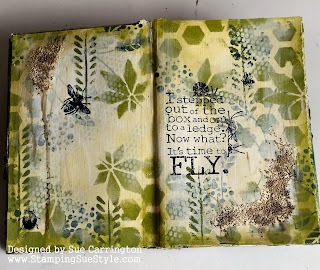 I have experimented with numerous mediums to show you that you can try these techniques with whatever products you have on hand. For this panel I used white texture paste through a dotty stencil, then splashed various Twinkling H2Os over it. 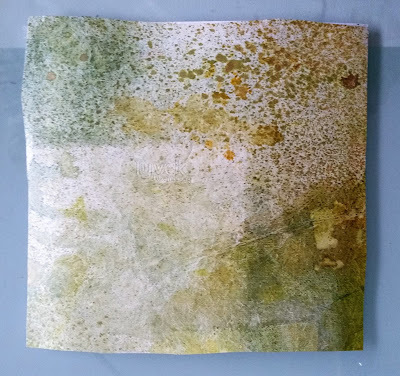 The white shows through these transparent watercolors. For this panel I adhered various die cuts then painted it all with black gesso. Next I dry brushed white gesso to add highlights, then went over it all with Radiant Pearls. Again, the white shows through different than the black, creating beautiful depth. For this panel I sponged several colors of Lumiere metallic paints, then embossed a stamped image repeatedly in black. 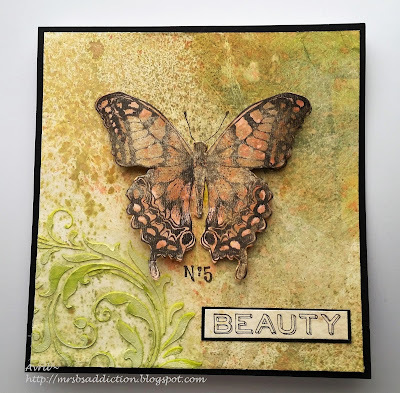 For this panel I first embossed the blob stamp in copper. 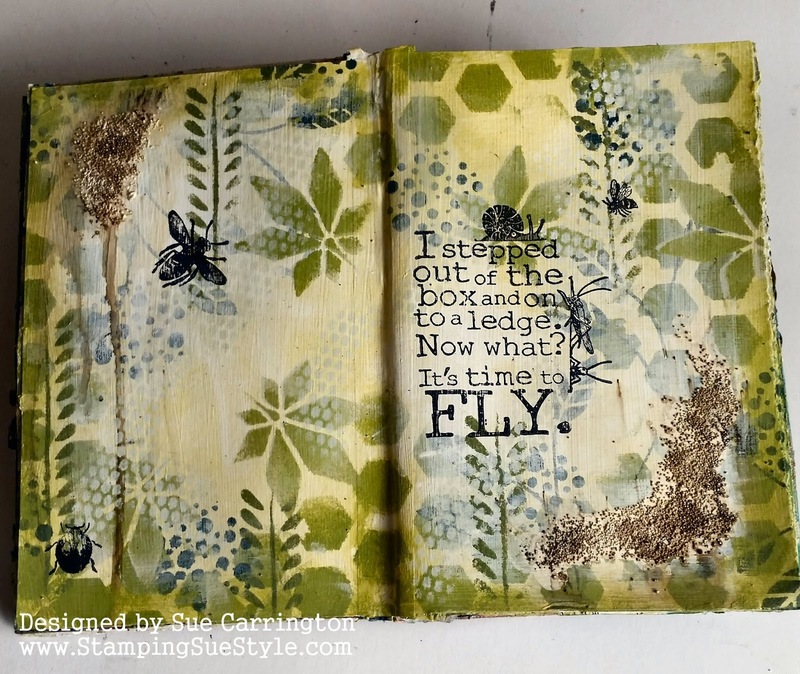 Next I used Versafine ink with a grid stamp and text stamp. I lightly brushed PearlEx powder over the wet ink. For this panel I splashed white gesso onto my panel then splashed Radiant Pearls over that, and came back in with splashes of Color Bloom spray. 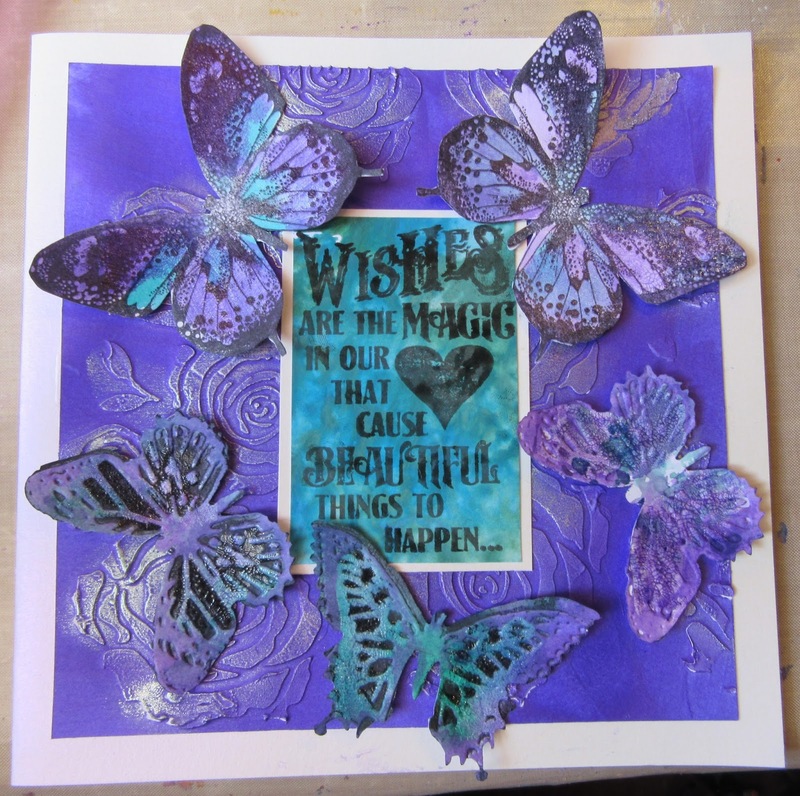 For this panel I used white stencil paste and then splashed both Glimmer Mists and Color Bloom sprays over that. 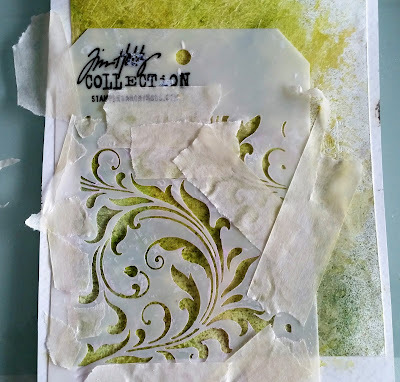 For this panel I used a plastic card to scrape Lumiere paints onto my black panel, adding additional colors while the paint was wet for a beautiful blending. My final panel was made by crinkling tissue paper onto a wet black gessoed panel. I went back over the top of the tissue with more black gesso. The highlights were created by lightly sponging Lumiere paint onto the raised areas of the tissue. I created a pinnable image for you to pin this tutorial to your Pinterest boards. I have turned each of these background panels into completed mixed media cards and will be sharing them on my personal blog for the next couple of weeks, so do pop by often. 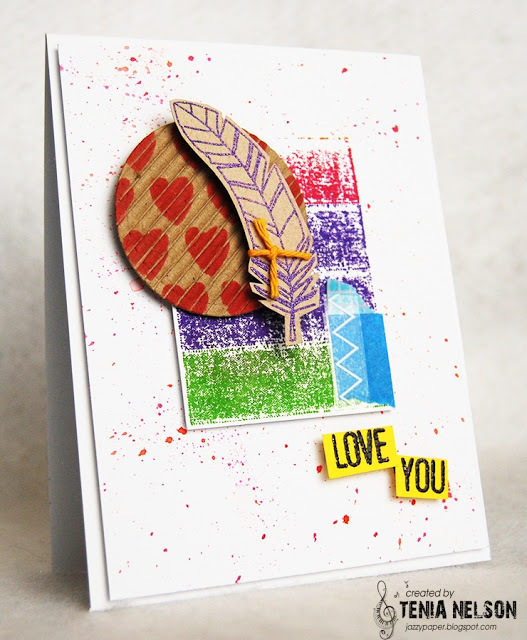 But I won't leave you hanging and will share my basic design recipe as you see in this card. 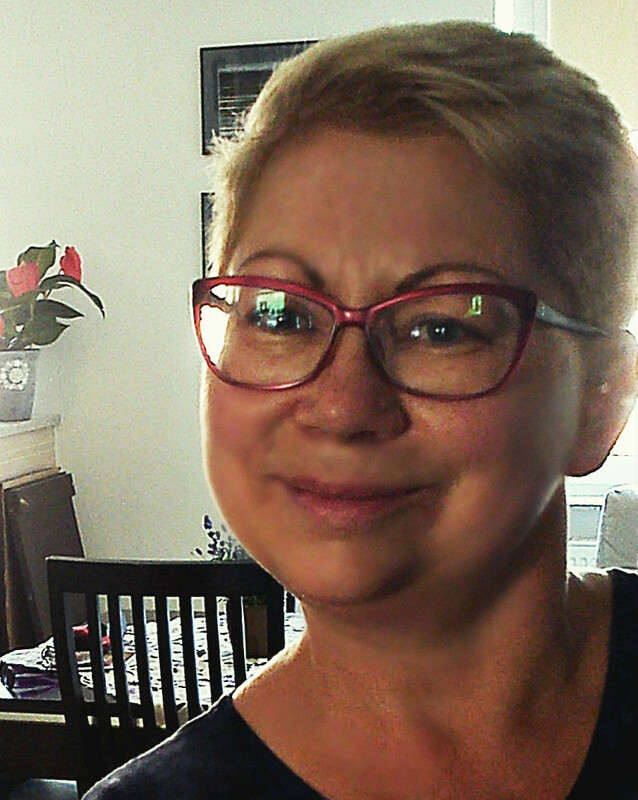 Today we are welcoming back Lula as our Guest Designer. 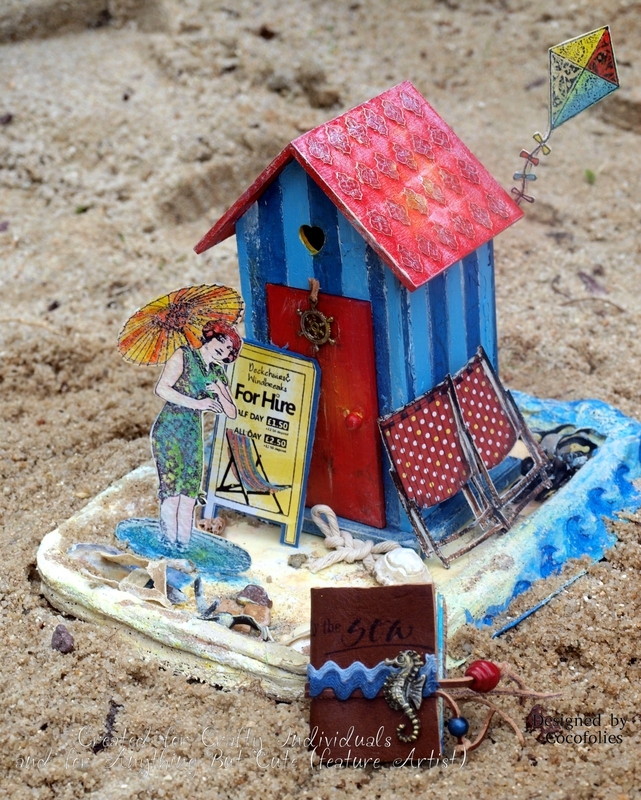 Lula is not a stranger here at Stamps and Stencils and it's always a pleasure to share her fabulous work. 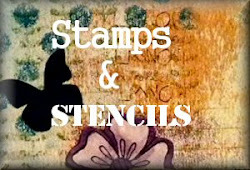 Hallo Everybody,I am thrilled to have been invited to guest design for Stamps and Stencils. Thanks bunches Ladies for this opportunity! My take on the theme TIME TO TAKE FLIGHT is a butterfly sitting on altered round, wooden box. I started with gluing some paper pieces which I have stamped before. I have also inked all the edges. Then I prepared the gypsum head with hair from wool, all covered with brown powertex. I added some beads in the hair too. Now it was time for wings. I fussy cut a butterfly, than decided to use only a part of it. 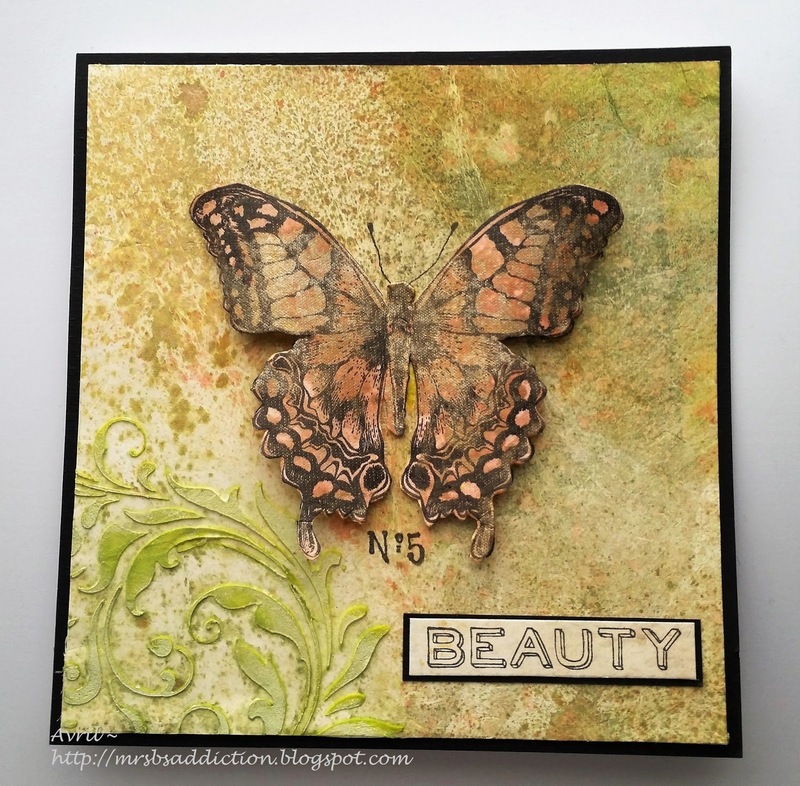 I stamped it, added some texture paste through the stencil and embellished it with some small chipboard butterflies. It was later sprayed with some mists and painted with metal paint. I'm sure you'll all agree that Lula's project is fabulous ! 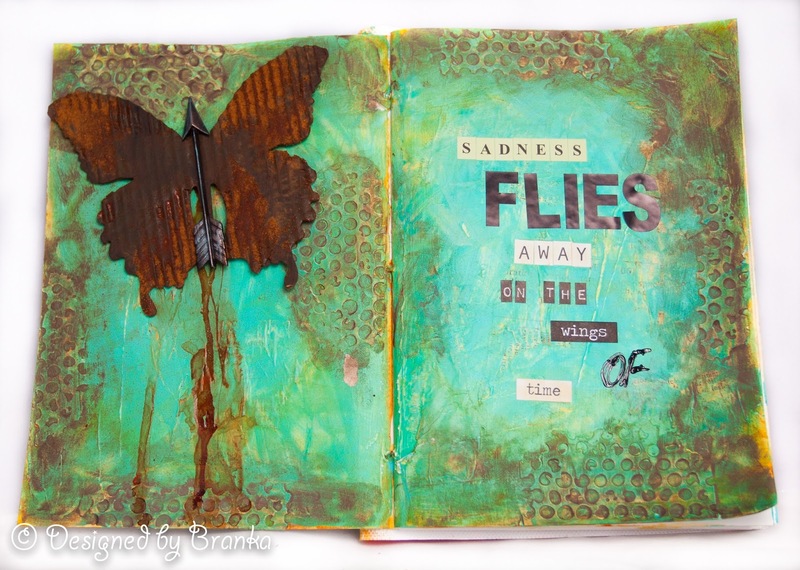 You still have time to join in with the current challenge, Time to take flight, and Lula's project has provided you with lots more inspiration. 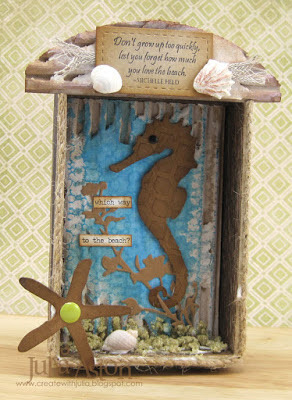 We loved Corinne's 3D project and all the details that was included. 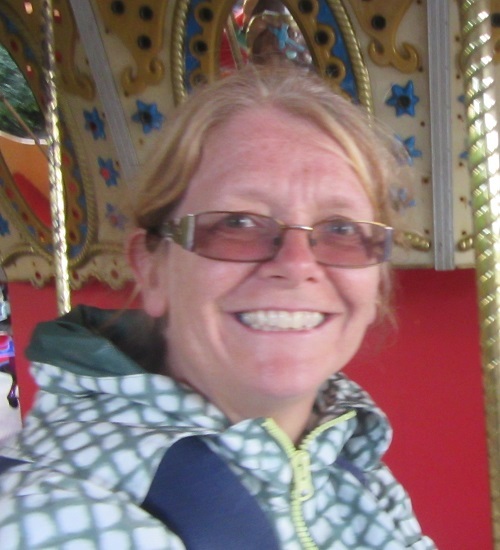 Corinne please email carringtons22@yahoo.co.uk for details of your Guest Designer spot and winners badge. The current challenge is Time to Take Flight and you've still got plenty of time to share your projects with us.